Award-winning Reverse Charades is a hilarious twist on the classic game of charades. Instead of one person acting out a clue for a team to guess, a team acts out clues for one person, so now everyone is in on the fun! In 60 seconds, teams attempt to guess as many words or phrases as they can. The team with the most correct guesses wins. 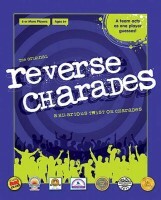 Reverse Charades is perfect for family fun, parties or team building. Add a Review for "Reverse Charades"